When a femme fatale enters the room, there is nowhere to hide and this girl is not only beautiful she is tough and brave too! But this Asian tigress now needs your help to defend her village which is under attack. Clear and concise graphics and sound help you all the way through this adventurous play slot online game. Can you help this beautiful maiden keep her family and friends safe? If you have enjoyed ‘Dangerous Beauty’, it could well be worth checking out ‘Big Dragon Lounge’ and ‘Chang E Reaching the Moon’. High 5 Games continue to excel in the online casino arena and through their innovation have, and continue, to produce an extensive games portfolio which is top notch. Find other gammes from High 5 Games here at Wizard. This game has a definite martial arts ‘way of the sword’ feel about the illustrations. Now, with her land under siege, this Dangerous Beauty must ask for the help from other brave heroines to protect her own village. Dangerous Beauty has 4 by 5 reels and 10 and 40 paylines and the graphics are clear and concise making this very easy to play. Many symbols are displayed on the reels including Dangerous Beauty images and tigers, also other playing card icons which range from the Ace to 10. For more games, check our guide with the best UK video slot games now! The Dangerous Beauty symbol also acts as a wild symbol. The Green Dragon is a scatter and also your chance for free spins, but it must be showing on all three reels to trigger this. When symbols are stacked, this allows multiple winning combinations. 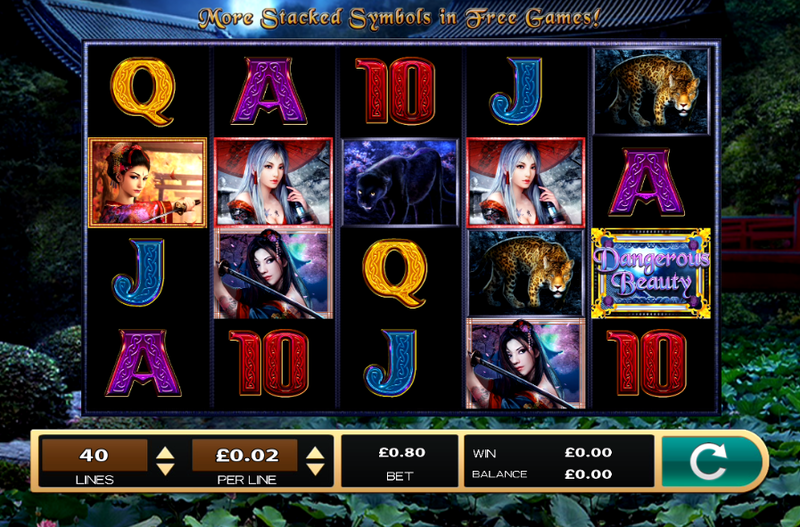 If you see the Green Dragon symbol on reels 2 to 4 at the same time, this will enable you to have 7 free spins. With 40 adjustable paylines, Dangerous Beauty allows you to find your preferred bet size. Are you on a low budget? The most you can bet per spin is a lot lower than many games, so is perfect for any beginners or those who do not want to spend too much. Majestic in her bravery and with swordsmanship like no other the ‘Dangerous Beauty’ will draw you into her fantasy world. With stunning graphics and ease of play, this game is certainly a great playing experience. This is perfect for those who are beginners in the world of gaming and also for those on a limited budget. This game is clear and concise and very beautiful to look at and is a joy to play. Or play Mustang Gold!